A sleek, no-dome design means AXIS M3047-P is easily concealed from view. 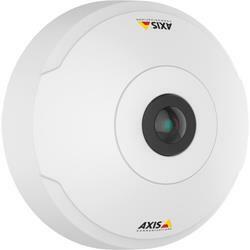 AXIS M3047-P is made from environment-friendly recycled plastics, and there's an optional black casing available. The camera can also be repainted to blend in discreetly and seamlessly with your interior color scheme. Smoke detector and vandal-resistant casings are also available as accessories. The former helps disguise the camera and the latter provides additional security and peace of mind.